Knowing when you’re ready to move up the stakes in cash games from $0.25/$0.50 to $0.5/$1 or whatever is something everyone faces at some point. Especially at the lower levels, where it’s easier to be at the top earning a higher bb/100 win-rate, you will move up the stakes faster. One thing I will say about moving up the stakes from NL10 or below, is that it is in your interesting to move up the stakes as quickly as possible. When you move up the stakes, the additional profit you make is massive compared to how much additional skill you need. For example, a multi-tabling NL50 player making $15,000 per year will make twice as much as an NL25 player making $7,000, however there isn’t “twice” as much skill needed at that level. You only need to be 20% better at most. Another reason it’s in your interest to move up the stakes is that as you get older you become more risk averse. It’s better to take risks whilst you’re young and wiry, rather than get to the point where you’re life is dependent on poker and you can’t afford to take the same risks. This is breakthrough for any poker player looking to go pro. You can start playing professionally at this level and make $30,000+ per year easily, and if you learn to multi-table 5 or more games whilst maintaining a decent 12bb/hr win-rate then you might break the $50k mark. The downside to this it there there is a huge gap in difficulty from NL50 to NL100. Most players below this level are amateur and so you’re effectively crossing a pretty big gap in terms of playing quality. 3betting, floating and OTT bluffing post-flop are extremely hard to get used to and your game needs a big step up. There is also a much smaller proportion of fish at this level (maybe only 10% fish as opposed to 30% at NL50). How Long Does it Take to Move up the Stakes? This is a damn good question. To make it simple, I’ll provide a very basic case study. If you play NL25 and earn 3bb/hr across 4 tables, then that’s about 12bb/hr or 96bb/day ($25 per day). Let’s say you need to double your current bankroll of $250 to $500 to move up to NL50, this is 100x table buy-ins. 500/40 = 20 days. Thus, if you play hard ball you should be able to move up the stakes within a matter of 3 weeks. If you’re only playing a few hours per day however, it may take a month or two to get to the same level. This isn’t the end of the equation though, because you need to be able to adapt to the higher stakes and be competent enough. (Also, not many amateur players play full time all year round). It’s simply not possible to blast through the stakes like an F1 car because the gap in quality is so different. What you’re doing at one level won’t correlate to the same profits at a higher one, you need to learn to use table position to your advantage and improve your post-flop skills. What BB/100 should I be achieving Before Moving Up? To begin with, you should only ever consider moving up the stakes once you become competent where you are now. A good win rate at the micro stakes might be something like 7BB/100 i.e. if you’re playing four tables of NL25 then you’re making more than $5/hr. I think this is the level a lot of young players find themselves at, because once you climb past these the game becomes a bit tougher. Now, unless you’re churning a decent profit in your current game correlating to 5 or more big blinds per 100 hands than you should stay put. Why move up a level when you’re not even maximising value at the moment? The right time to move up the stakes is when you’re making good profit. A secret tip is to do this slowly i.e. mix one or two NL50 games in your screen every day. By slowly dipping your toes into the higher stakes games, you allow yourself to adjust and offset any variance by still grinding profit in the NL25 games. 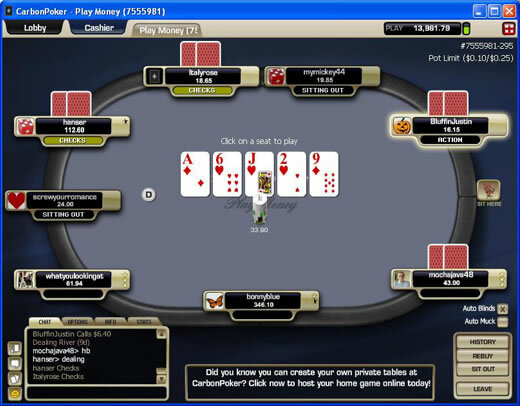 Remember my rule about multi-tabling – don’t multi-table with different stakes simultaneously. If you’re playing NL25 here and NL50 there your screen can become confusing and you end up making the wrong size raises. I know I know, the 100 buy-in rule is “bankroll management” and one of the most important rules in poker. Well, this is only sort of true. Most pro’s will actually tell you that you can afford to play with 30 buy-ins. It might shock you to hear, but back in the day during my NL50 days I only ever played with a $400 bankroll (8 buy-ins). The fact is, if you’re happy with your game and you’re making profit then there is no need to abide by the 100 buy-in rule. You just need to be careful however. If I had a day where I lost a few buy-ins then I would move down the stakes. If you’re playing the 30 buy-in rule, then make sure you move down the stakes if you manage to go down 5 buy-ins. This is plenty of insurance and will prevent you going broke.